Efficient Energy Choices Blog: Part 3 - What about wall insulation? Part 3 - What about wall insulation? We recently rated a double-storey dwelling; walls for both floors were light weight Polystyrene 75mm foam board. The project complied with 5 stars exactly, with ComfortPlus type windows. The client requested to change the ground floor from Polystyrene to brick type. When rated, it did not comply, it was 4.9 stars. We suggested the use of Air-Cell Glareshield foil type or an approved equivalent, giving additional insulation of approx R1.7 to the ground floor walls. Total wall insulation = R2.0 + R1.7 = R3.7. When it was rated, it complied at 5.2 stars. Good quality foil products can significantly increase insulation performance and improve the energy rating efficiency. They can also be used in roof, giving additional insulation of approx R1.2. 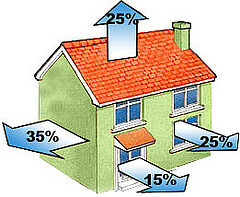 Total ceiling/roof insulation = R4.0 + R1.2 = R5.2. For suspended enclosed timber floors, Air-Cell Permifloor 500 or approved equivalent, will give R.3. For application in apartment buildings, even though each apartment is already thermally insulated and protected by its adjacent neighbours, adding wall insulation between apartments will be of great benefit. From our experience, this will significantly increase the thermal rating efficiency by approximately 10% - 20%, and provide acoustic benefits as well of approximately 8 - 10 dB(A). We recently completed an offices development project in Beaconsfield and recommended Kingspan Koolthem K17 insulated plasterboard panel, R2.8. Refer to photograph depicted. 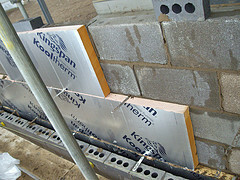 For more information about this product, refer to http://www.insulation.kingspan.com.au/. Have you found this to make a difference?